Over the past two months on Google+, I’ve been meeting lots of new people, and many of them new bloggers. I always enjoy heading over to these new blogs to take a look, read over their content and try to add an encouraging comment. 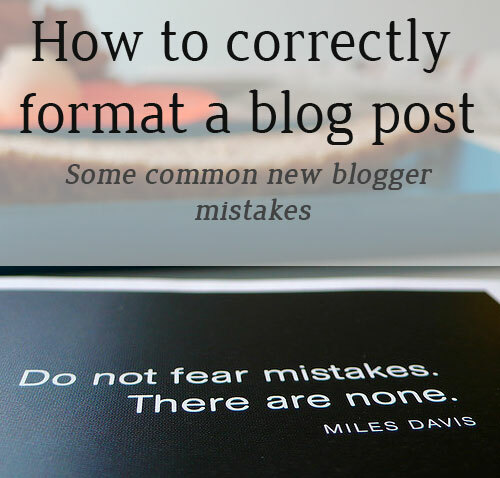 While visiting all of these new blogs, I started seeing some common mistakes new bloggers were making, especially related to post formatting. When I first started blogging, I really struggled with how to best format a blog post, and it took me more than a year to determine the format that worked optimally for my blog and readers. Post formatting is something I still adjust on a frequent basis. Again, always new things to learn. Interested in learning how you can help retain people on your blog, entice them to read your article, and make them a subscriber? The small little tips I share below can really make a huge difference in your blog. This is a big one. I was visiting a blog the other day, and the article was just one big long stream of text with very little white space, and no logical breakup of the content. Using sub-headings provides a visual break in your post, allows the reader to skim over the content, and has an SEO benefit. Google gives priority to text in sub-headings – use them. The line above that says “Use Sub-headings” is itself a sub-heading as are the other common blogging mistakes listed here. See how it’s easy to skim over the article and know all of the common mistakes without having to fully read the article? This is really helpful for the reader. Sub-headings are generally <H2>, <H3> or <H4> tags. If you’re using Thesis (affiliate link) like I am, your sub-headings should be <H3>s. To determine which one to use for your theme, see what heading level your article title is. Then use the next level down. Using the wrong sub-heading can hurt you your SEO optimization a little, so make sure you are using the right one. Google likes things well organized and hierarchical. This is actually more of a recent trend, and one I probably started using a little late. I always wrote my article more like a book using longer paragraphs. That’s also how my generation was taught to write. Not so with digital content. People are busy and when they pull up an article and it’s wall to wall text from top to bottom, they perceive the article as being bigger than it really is and leave. Putting more white space in your article creates a perception that it’s not as large and overwhelming. Additional white space also makes the article easier to read and skim. See the trend on skimming? Really important in today’s web. Most of your visitors will not read your whole article, most of them will skim it. They’ll read the parts of interest to them, and ignore the rest. Breaking your text into smaller “chunks” allows your readers to quick find and digest each chunk and move on. Oh, and if you don’t use paragraphs, please use them. Nothing will drive a visitor away faster than a wall of text. I know, black text on a white background is boring. I agree, I really do. But you know what? Black text on a white background is highly effective. Blogs are met to be read, and anything done that makes it difficult for your visitors to read your blog, hurts your blog. Make it easy, and use black text on a white background. Spend some time looking at the biggest blogs on the web and you’ll see the same pattern. One the blogs I’ve been reading for years and still love to read is Copyblogger. Hands down, they win my vote for best site design. What do they use? Black on white. Be different in your header, your sidebar, your footer, the graphics that you use in your content, but don’t be different with the colors you use for your copy. Again, we want people to read our blogs. Focusing on making our blogs easy to read and skim, you’ll want to use a larger font. Many fonts used in content on blogs are too small. I know, some of you are young and have no problems seeing it. Well, for geezers like me, it hurts my eyes and gives me a headache to read a large article when the font is too small. Yes, I can increase it using my browser settings, but most of the people that visit your site don’t know how to do that. I’ll say it again: Make things easy on your readers. Script fonts are cool, but they’re hard to read. Sometimes really hard to read. I generally won’t read an article that uses a strong script font because by the time I’m half way through, my head hurts. Seriously. Just say no to script based fonts. This one might generate a little controversy, but I recommend targeting a high-school or middle-school reading level. Use anything higher and you might begin to use words that people don’t know. This results in them not understanding your article. Even worse, they might leave to go look the word up, and not come back. I always find it funny when people use big fancy words – I just don’t get the point of it, unless they are trying to impress people with their vocabulary. You should target your site for the majority of web visitors. This gives your blog the most exposure and largest audience. If you write at a college level reading level, you’re turning people away. If you’re ok with that, than by all means continue. Google likes bullets and so do your readers. Not too many mind you, but a reasonable amount. Using bullets also makes your article easier to read, skim and follow. Use bullets for short lists. Using bullets makes your articles easier to read, easier to write, more skimmable and improves your SEO. Avoid using bullets for items that require longer explanations. I’ve made this mistake before, and find that using Sub-headings is more effective and readable. Using bullets for large amounts of text actually ends up making it harder to read, and takes away from the advantage of using bullets in the first place. When was the last time you read magazine that didn’t have images alongside the text? Think of your blog as an electronic magazine. Everyone of your posts should use images or visuals to help bring the points home. Images will also often entice a visitor to read an article that wouldn’t normally read. Why? Because the image draws them in. With all of the free images for your blog available, there really isn’t a good excuse for not have outstanding and high quality images in your blog articles. I suggest having at least two images. One early on in your content so the visitor sees the introductory article text AND the initial image. Then, and midway down or towards the end of the article, having another. There really isn’t any right or wrong size or shape, just develop your own unique style and people will associate it with your brand. The first part of your article should tell the visitor what you’re going to tell them. An executive summary if you will. Keep it to one or two paragraphs and be concise. The last sentence should be somewhat of a teaser to make them keep reading. The middle sections should be the “guts” of your article, the real valuable stuff. What mistakes have you seen bloggers making? Disagree with anything I touched on above? What would you add or remove from the list? Add a comment! Don’t use big words? Preposterous! Thanks for the tips! I’ll be taking another look at this list before I hit the “publish” button for my next post. Another tip I’d like to add with regard to terminology, or big words, is: if you have to use big words or “technical jargon,” consider defining them. You can link the word to a dictionary website, or define the word in the text. @Charity – Good tip on linking words. Great article Larry. I love how you make the comparsion to font styles and backgrounds. You hit the proper way most people read very well. Subtitles are very important because it makes it easier to follow the article. Thanks Michael, visuals go a long way towards helping people “get the point”. It’s nice to know I generally format my articles properly. 🙂 I love lots of pictures. 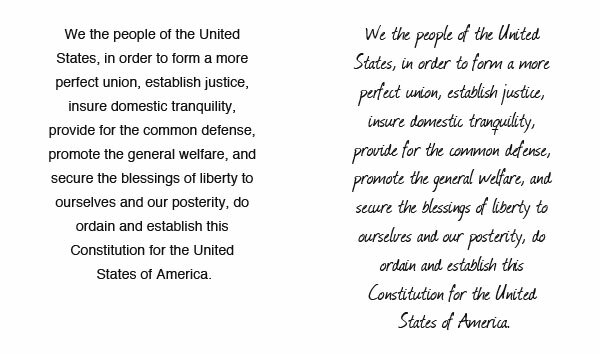 And I completely agree with you on the script fonts. That’s the quickest way to make sure I hit the back button. Bolding main points can help, too, though I think I overdo the bolding sometimes. I never really used bolding much, but Baker from Manvsdebt used it pretty effectively, so I thought I would try it and liked it. It’s a great way to draw attention to what’s really important, especially for skimmers. I can’t read white text on a dark background…just skip it, unless the winning lottery number is written there. One question I have is about the sub-headings…don’t know how they’re invoked in Compose mode on a Blogger blog so will have to look that up. Anyway, thanks! Loreen, I actually did mean “Black text on a white background”. 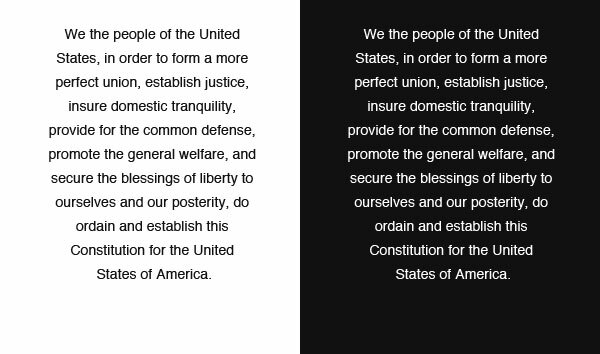 Effective, meaning far more easy to read. I’m not sure how to do sub-headings on Blogger either, I’ve only played with Blogger a little. I am always try follow these rules when I publish any article. One thing keep in mind that is when you will add sub heading try to use your seconder keyword of your article it will increase more SEO value. This was wonderful information! I try to do most everything you’ve described. I write a dessert blog, so I often use bold & italics to highlight descriptive words about the recipe in my opening paragraph. Sometimes it is necessary for me to link to other blogs or other recipes, and I will often use a different color in my text so that those will pop as links. I often wonder if I’m overdoing it though! This was really helpful to read and I thank you for sharing this information! Helpful article, thanks. I actually like the line spacing of your site. That’s something I’ve never thought of doing. Also, I use sub-headings sometimes, but I never tag them as such. Useful tip for SEO. Sorry… I am a big fan of writing clearly and with the most basic word possible. But I’m not dumbing my content down. If I lose readers, so be it. I see your point; it’s just not for me. Thanks, will share this article. Hi Anne – Glad you enjoyed it. Thank you very much for stopping by and for the comment. Hey Deb – Thank you for stopping by. I’m not suggesting that anyone “dumb down” their content, just that they be aware that the higher grade level you target, the more restricted your audience becomes. I was more referring to vocabulary more than anything else. I would not advocate reducing quality either. Paula, thank you. I use Sans-Serif 14px. But honestly, I’m thinking about bumping it up a little and maybe even using a Google Font to make it even more readable. I always try to format my articles well – I think it makes it way easier for people to read. I think subheadings should be the most important takeaway from your article for all bloggers – I always get annoyed when someone doesn’t use sub-headings in their articles so it’s just one long text. Hey Larry – Do you think it’s weird to just change your formatting all of a sudden? I guess increasing font size and line spacing is not too much of a big deal. Thoughts? Thanks, really helpful. I kinda figured out most of this part after creating and going back and actually “looking” at my post. What I have the most problem with at this point is insertion of gadgets and buttons. But I signed up, hoping to become more informed and possibly even figure out how to make this passion generate some income…..that would totally knock me out!! It may seem like such a simple topic, but this is one of the best posts I’ve seen about blog issues in a long time. Very helpful. Thank you! Louise, I’m with you – sub-headings are really important for making the article easier to read and follow. They also have significant SEO benefit as well. Certainly a win all around. Thanks for your comment. Deb, no I don’t think it’s weird at all. People make changes to their sites all the time. If you’re uneasy with it though, just write up a quick post explaining the changes and why – Telling your readers your trying to make the site better for them will do nothing but help you. Wow Shawn, thank you very much. Good tip Rifat, thanks for adding that. Larry, the only thing I disagree with you on is your stance on “fancy” words. (Hello, controversy…) My vocabulary is an extension of me. While I’m mindful of my readers, I’m also true to my voice. (Wouldn’t be “me” if I didn’t throw in a discombobulated thought now and then!) Not trying to impress anybody; I just write whatever comes out — with pictures in between. 😉 You’re welcome to come see for yourself. Thanks for an excellent post! Hey Kim – If that’s the way you write and the way your readers like it, than go for it. I just wanted people to be aware of the trade-off. I know there are very many successful bloggers that do well using college level vocabulary. Me? I could, I just prefer to keep it simple. Thanks for the comment and your kind words! One of the things I love about blog world is that everyone has a unique take on things, including their choice of words, which may or may not appeal to everyone. (Mostly, I feel “blessed to express.”) Thanks for responding to my comment! Not everyone uses “big, fancy words” intentionally for some huge “purpose.” Some simply have a sufficiently educated vocabulary that those words come perfectly naturally. And for some, their purpose is as simple as using the most accurate word in a given context. Thanks for the comment Rachel, but I would argue that if those people, myself included, have a “sufficiently educated vocabulary” than they should also be sufficiently educated enough to know that a large portion of the population isn’t that “sufficiently educated”. Meaning, their reading audience may not recognize the words and be turned away. This is why I recommend targeting a high-school education, the vacabulary at that level is sufficient enough to get your point across, and still reach the maximum audience. Using higher education words just limits your audience. I just don’t understand why people would want to do that. …implies that bloggers who use a more upper-level vocabulary in their writing are doing so on purpose to prove some point. I just wanted to point out that for some, it just comes naturally. And while you’re absolutely right about the reading level of most Americans, it comes back to knowing your audience. Depending on what you typically blog about, more complex vocabulary might be perfectly “safe” – or it might not.